Rachel Morgan is a runner for Inderlander Security in Cincinnati, using her powers as a white witch to track down supernatural criminals. Rachel’s world diverged from our own in the sixties, when the government focused funding on bioengineering rather than the space race. The result was the Angel virus, spread by genetically modified tomatoes, which wiped out half of the human population. Only the presence of the Inderlanders—witches, vampires, and weres immune to the virus—kept the world’s infrastructure from collapsing. Long a shadowy minority, the Inderlanders rose to prominence and power, but never gained the trust of the diminished human population. Since the Turn, humans have crowded into city centres to be close to one another, leaving the former suburbs to the supernatural. In Cincinnati, these neighbourhoods are called the Hollows. Tired of getting the worst assignments from a boss who hates her, Rachel decides to quit the I.S. and go out on her own, refusing to believe rumours of hits on ex-runners who renege on their thirty year contracts. Unfortunately, she attracts her boss’s ire when his top runner, vampire Ivy Tamwood, decides to quit to join Rachel, and the hit becomes all too real. Desperate to pay off her contract before she ends up dead, Rachel sets her eye on bringing down one of the I.S’s oldest and most elusive targets, Councillor Trent Kalamack. Biodrugs have been illegal since the Angel epidemic, but Rachel has reason to believe that Kalamack is mixed up in the drug trade. Bringing down Kalamack would be enough to pay off her contract and get the I.S. hit cancelled, but if she doesn’t play it right, she’ll have two powerful enemies instead of one. Rachel and Ivy have a tense but intriguing relationship. They joined the I.S. around the same time and worked together for a year, but didn’t exactly jive. Rachel is extremely surprised when Ivy asks to be her business partner, and the situation becomes unexpectedly tense when the hit on Rachel causes her land lady to evict her, forcing her into close living quarters with Ivy. While professional at work, Ivy is a living vampire, not fully turned, and sworn off blood, but Rachel can’t quite trust her not to bite. Although Ivy obviously considers Rachel to be a good runner, Rachel likes to fly by the seat of her pants, whereas Ivy always needs to have a plan for every angle. Their talents have the potential to be complimentary, but as their partnership gets off to a rough start, they end up butting heads instead. Back up and comic relief is provided by Jenks, a feisty pixy with a passel of pixy children. Although I wasn’t enamoured of the writing style, I enjoyed the character dynamics immensely, as Ivy, Rachel, and Jenks try to figure out how to work as a team in their new business. When it comes to the writing, Dead Witch Walking is undeniably a bit rough around the edges. With a bit of stilted dialogue here, a forced twist of the plot there, and some inconsistent grammar and punctuation, more polishing and editing wouldn’t have gone amiss. Sometimes Rachel will drop a new piece of slang without explanation, and other times there are long detours from the story to clarify the terminology. 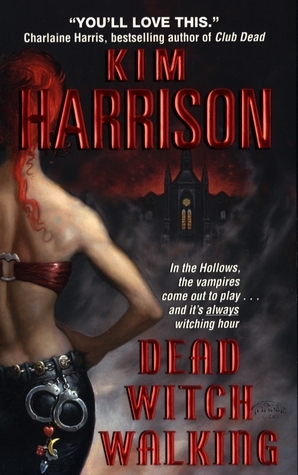 But Kim Harrison has assembled an intriguing cast of quirky characters, and made a good start on her world-building. The action is intense and well-paced, and has a real sense of urgency. The success of the Hollows series in the ten years since Dead Witch Walking debuted makes me think that it is worth giving the series a chance, despite a slightly bumpy start.